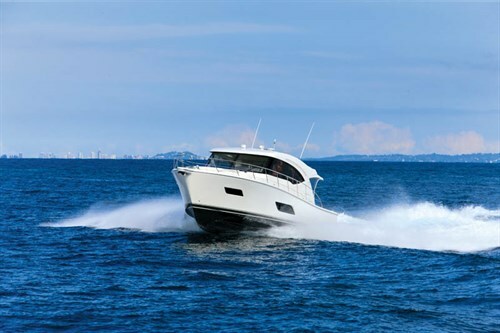 Cruising at just under 20-knots – the distictive side widows provide great internal light and views. The cabin opens out to a spacious rear deck and transom platform, complete with voluminous storage. efrigerated storage and everything you need for handling fish are nearby. Stainless steel siderails and walkways lead to the well-equipped foredeck. A luxurious helm has the best navigational aids and great visibility. The engine room sets the standard for quality and practicality. Not a bad view from the number three. Out on a mild sea, the 515 hit 31.5kts with the throttle wide-open – the ride was smooth and soundless. The luxurious Riviera 515 SUV is a spacious liveaboard entertainer with plenty of seafaring credibility. 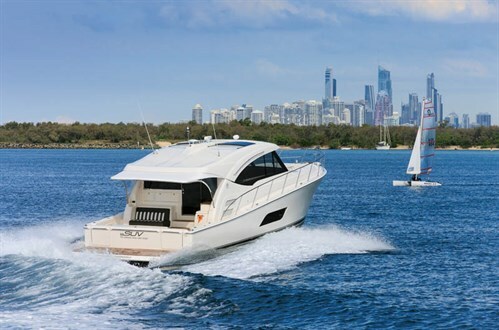 The Riviera 515 SUV is the latest in the Riviera SUV range, a range of luxury boats that have been developed for those who want all of the facility of a chic entertainer, but combined with a practical flow-through design for easy family living. All of the window heights have been lowered, ensuring you feel part of the on-water environment without confines. This Riviera reflects our outdoor lifestyle, with large cockpit areas, flowing transoms and large boarding platforms that are truly part of the overall livability, not an afterthought. The Riviera SUV range is also directed to those who are coming up from smaller boats into a true live-aboard seafarer. Riviera luxury boats for sale. Initially, Volvo wouldn’t allow such a layout with its IPS drives due to flow issues around a full-length keel but, by working as a team, Riviera has developed a shortened keel that allows full water flow around the drives, combining all of the tracking and stability benefits combined with the efficiency of modern pod drives. The Riviera SUV hull is a solid, vinylester-infused fibreglass design with foam fill to the forward underfloor area. The construction is fully compartmentalised, with a watertight collision bulkhead forward and solid fibreglass keel, chines and engine area. The externals feature lustrous isophthalic gelcoat that has been proven to stand the test of time, especially when backed up by the longevity of vinylester resin. From the moment you step onto the large teak-lined transom platform the boat speaks size and flow. By having an access door either side of the transom the platform actually feels part of the entertainment area instead of an addition. The platform has a 350kg lift for docking tenders and personal water craft and can be customised with spigots and retaining rails to suit. The rear cockpit is large and inviting with its teak lining and rear-facing mezzanine lounge under the stainless steel-framed café style window. Opening the gas strutted lids on the transom bulkhead reveals a nifty Kenyon barbecue and grill, as well as a deep icebox and storage. The wet well could be plumbed as a decent livebait tank if so desired. Two stairs lead from the cockpit into the saloon with a very inviting flow to the U-shaped galley to port. The stairwell flips up to provide easy access to the engine room, which sets the standard by which all others should be measured. The labelled plumbing, colour-coded electricals, access to service points, neatness, engineering and layout are to be commended. Standard power unit is the new generation and fuel-efficient twin Cummins QSC Zeus 600 pod drives, although our test boat was aptly powered by twin Volvo Penta IPS 800s with a further option for 950s if so desired. The 800s returned better than 30kts at wide open throttle with around a half load of fuel and water, which is entirely pleasing for a package of this capability. There’s an Onan MDKDP 13.5kW generator. 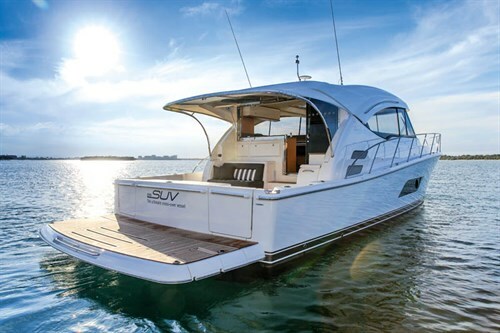 As you enter the saloon in this Riviera, to starboard is a Vitrifigo fridge/freezer, icemaker, rope locker, sink with pop-up tap and freshwater, 240V outlet and the Volvo joystick controls for very easy docking capability. If manoeuvring a boat of this size is a concern, forget it – the joystick controls make it child’s play. The saloon roof extends out to the edge of the stairwell and lounge and a very solid stainless steel-framed soft awning provides further protection to the cockpit. As you enter the Riviera’s saloon from the cockpit there is a sense of spatial enhancement, complemented by a premium café lounge demeanor. Huge, low-line windows combine with two large electric sunroofs, with pullover awnings over the lounge and dinette area. The designers have combined Amtico teak flooring with American oak joinery, beige Ultraleather upholstery and faux granite solid bench tops. The whole demeanor is fairly low-line, adding to the appeal. It is all slightly ‘blocky’ or square in styling, yet offset by curved timber accents, highlighting the beige roof liner and creating a very comfortable living space. 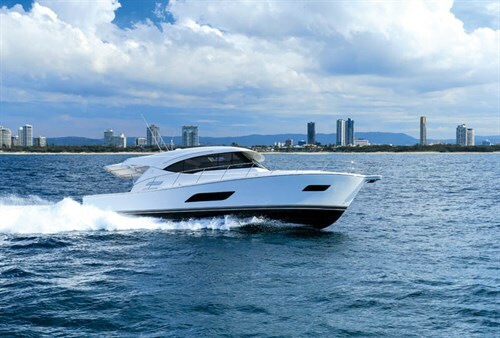 The U-shaped galley reflects the excellent design of its big sister, the 565 SUV. It allows full traffic flow throughout the boat without impeding the preparation area. It is fully equipped with LG convection/ microwave oven, Kenyon convection cooktop, a dishwasher with remote drawer, tons of storage, pantry and utensil space, and a total of four large fridge/freezer drawers under the starboard buffet. Most important is the huge amount of open bench space and the feeling that the galley is the centre of the entertaining area – as it should be! 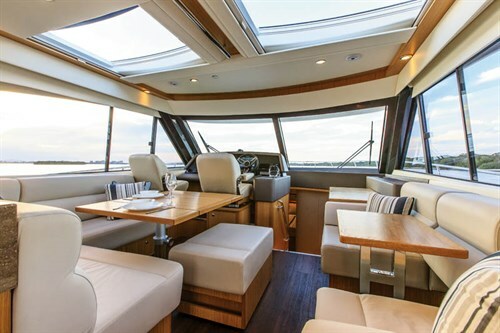 Like the galley, the opposing buffet to starboard has matching overhead cupboards as well as the full house-monitoring system, C-Zone air control and 240V outlets. The window line extends right to the rear of the saloon, extending that feeling of space. As we move forward there’s a lush, upholstered L-shaped lounge with a very utilitarian table that converts from a coffee table to a grand diner in seconds. Opposite is another convertible lounge with a removable centre ottoman and pop-out table that allows terrific flexibility depending on your mood and number of guests. A large TV emerges electronically from the console behind the lounge. Downstairs the timber flooring leads to the three carpeted staterooms. You could actually flip a coin as to which stateroom to call the master – I believe the aft stateroom will take precedence, only because of the enormous hull window and opening port and that this position in the hull is quieter and more stable when underway. They both feature their own dedicated en suite as well as queen-sized square island beds. There’s much imaginative cabinetry, including behind the bedhead where cedar-lined cavities will keep your clothes fresh. The head height in the aft stateroom is down a little on that offered by her big sister, but I guess that has to be expected. The master ensuite is large, beautifully appointed, well positioned and features a full-sized shower, a big vanity, large mirror, plenty of storage and volumes of space, particularly around the toilet. 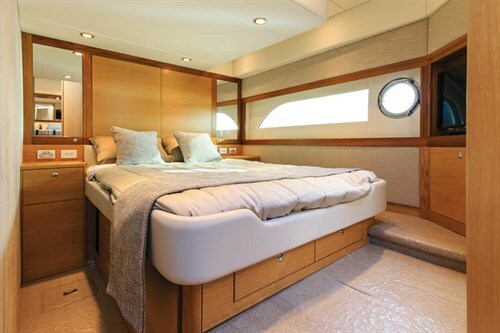 Pretty much the same can be said for the forward stateroom except that its natural lighting comes from two Bomar sunroof hatches in the ceiling, both with fly and privacy screens, as well as two smaller fixed glass hull windows either side of the queen-sized bed. There’s also a large mirror at the bedhead, creating a very spacious feel. The third stateroom features twin single beds as standard. The entry is just a little tight but this is a proper bedroom, not just crew quarters. Another large window and sensible use of mirrors lights the room naturally and again there’s plenty of cabinet space and a big wardrobe. Did I mention the Samsung flatscreen TV in every stateroom? The bathroom has access either from the aisle or from the forward stateroom. This is not a secondary bathroom as it features a full-sized shower, big vanity, large toilet access and plenty of space. There is a services cupboard in the companionway that houses a Miele washer/dryer and Dyson vacuum. The overall standard of the downstairs joinery, upholstery and fitout is terrific, as we all have grown to expect from Riviera. It’s a little more simplistic in appearance than some, but shows great versatility in design and complex amenity with refreshing appeal highlighted by the natural lighting. Simply, she’s a really comfortable cruiser/entertainer. We barrelled down out to sea at a very pleasing 19.6kts at 1800rpm, at which she held her nose up beautifully with extremely quiet efficiency and a fuel consumption of 148lt/h. Like her larger sister, the sea miles pass by effortlessly at a surprising speed and the ride is smooth and soundless. Punching into the rising one-metre waves on the bar passed by without notice as we glided through the swell. I cranked her into some full-bore turns where the torque of the Volvo Penta IPS 800 pod drives power the keeled hull with tremendous confidence, only wiping off around one knot from top speed. We cranked her up to reach a WOT speed of 31.5kts at 2450rpm and 240lt/h. It’s nice to know the power and manoeuvrability are there in case you ever need it, but really … it’s more about having a little hoon occasionally. Big kids with bigger toys, eh? Why not! She will cruise all day around the 20kt mark. However, when the going gets rough, or for that longer coastal cruise where you want to conserve some fuel she still sits up very well at a reasonably fast ‘slow cruise’ (does that make sense – I think so) of 18kts at 1700rpm drinking 129lt/h. Riviera has left no stone unturned and no wave unridden in the design and construction of the new Riviera SUV range, so the all-new 515 SUV is a terrific fit for a huge cross-section of the worldwide boating public. It doesn’t matter whether you are a matured cruiser, an old sea dog or a young enthusiast – the Riviera 515 SUV has plenty of character and ability to please you all, combined with an attitude that loves to party. *Sea-trial data supplied by Riviera.